Deluxe Edition with an introduction by Steven Ashe, author of Qabalah of 50 Gates. The Book of Enoch describes the fall of the Watchers who fathered the Nephilim. 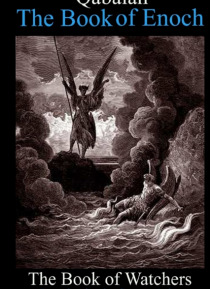 The fallen angels then went to Enoch to intercede on their behalf with God. The remainder of the book describes Enoch's visit to Heaven in the form of a vision, and his revelations. The Book of Enoch, written during the second century B… .C.E., is one of the most important non-canonical apocryphal works, and probably had a huge influence on early Christian, particularly Gnostic, beliefs. Filled with hallucinatory visions of heaven and hell, angels and devils, Enoch introduced concepts such as fallen angels, the appearance of a Messiah, Resurrection, a Final Judgement, and a Heavenly Kingdom on Earth. Interspersed with this material are quasi-scientific digressions on calendrical systems, geography, cosmology, astronomy, and meteorology.